The Atlanta Braves defeated the Miami Marlins 5-2 despite the loss of Ronald Acuna Jr in a fiery game. Braves rookie Acuna exited Wednesday's MLB clash after being hit by the first pitch he saw. 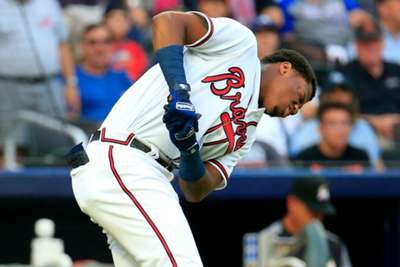 Acuna, who led off each of the first three games in the series with a home run against the Marlins, took a fastball to the elbow from starter Jose Urena, causing an enraged Atlanta dugout to storm the field. Acuna left the game after being hit, and Urena was ejected. X-Rays on Acuna's elbow were negative. Also, on a statistical note, his streak of five successive games with a home run is intact due to the fact he was hit by a pitch in his only plate appearance. Dee Gordon stole the show in the Seattle Mariners' 2-0 win over the Oakland Athletics. Gordon hit his second home run of the year in the 12th inning to give Seattle a 2-0 lead. Gordon has been known to come through for the Pacific Northwest squad as five of his last homers gave the Mariners the lead. The Baltimore Orioles gave up 16 runs on 19 hits against the New York Mets, and Dylan Bundy surrendered the bulk of it in a 16-5 loss. He allowed 11 hits and seven earned runs in 5.3 innings of work. Bundy dropped to 7-11 on the season with a 4.99 ERA. Curtis Granderson hit the 10th grand slam of his career against the Kansas City Royals and with it gave the Toronto Blue Jays a 6-5 victory. St Louis are in the postseason hunt and just one game back in the National League wildcard race. The Cardinals, who have won eight consecutive games, can complete the sweep of the Nationals on Thursday and better their odds. They are also in the middle of a seven-game homestand and will soon hit the road to face playoff contenders the Dodgers and Rockies.